Bookshelves and bookcases can make a room look more elegant and organized. If you have books, periodicals, magazines or even ring binders strewed around the room, it will look unkempt and untidy. However, installing a bookshelf or a bookcase can bring a semblance of neatness that is hard to beat. While there are many options for bookshelves and bookcases, narrow bookshelves and bookcases always stand out. Not only do they save space, but they add style and panache to the room besides being functional. You can choose from a wide range of styles and designs to complement the decor of your home. However, if you have knowledge in buying bookshelves before choosing the right product can be challenging. Well, you’re on the right place. We’ll help you choose the right product from this category that meets your preferences. 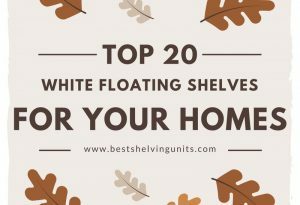 If you are looking for narrow bookshelves and bookcases, here are some options that are worth exploring. This sturdy yet elegant bookcase comes in pure white that is dazzling and relaxing. The bookcase has five functional and open shelves that can easily accommodate books along with binders and even decorative items. It comes with three adjustable and two fixed shelves, each capable of supporting up to 30 pounds. It has a contemporary design that is eye-catching, and the eco-friendly laminated particle panels just add to its overall appeal. This shelf does not take up too much space. It is about 19 inches wide, 11-1/2 inches deep and 71-1/4 inches high. Read: – If you are looking to save space with Narrow Bookcases, then Daybed Bookcases is something you should take a look at. Daybed Bookcases are combination products (bed+shelves combo) which help to save a lot of space. If space is a constraint, this tall and narrow bookcase is what you need. It boasts dimensions of 82 inches x 16 inches x 3 inches. It can seamlessly accommodate books and small items without using up too much space. It comes with adjustable shelves that you can arrange based on your requirements. Although a minimalistic bookcase, it can be used as a foundation to expand your storage needs. It is easy to install but does require two people for quick installation. 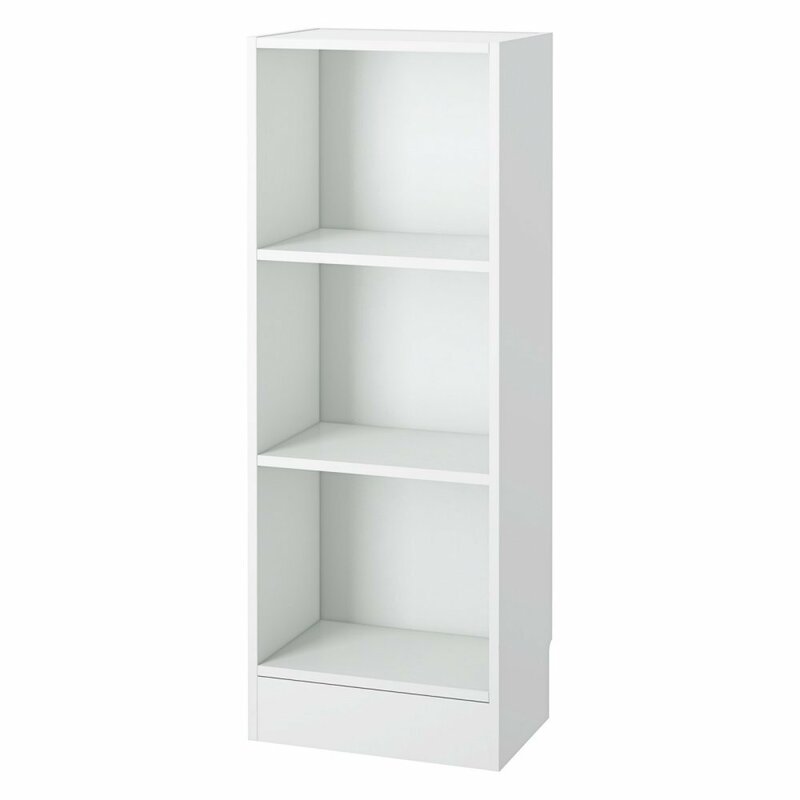 This white, tall and narrow bookshelf comes with a contemporary design to lend flair to a room. It has five fixed shelves and melamine surfaces that are easy to maintain. You can clean the shelves with a lint-free damp cloth. The metal hardware makes the shelves sturdy and resilient. Its dimensions are extremely attractive and stand at 16.8 inches width x 13.8 inches depth x 87.2 inches height. If you are looking for a narrow bookcase that can store more than just books, this near-72-inch open, narrow bookcase is perfect. It can house books as well as small potted indoor plants, smartphone docking station, Bluetooth speakers and much more. It comes with five shelves, and each shelf can effortlessly accommodate up to 30 pounds. This bookcase comes with two fixed shelves and three adjustable shelves. It is 19 inches wide, 11-1/2 inches deep and 71-1/4 inches high. The bookcase is made eco-friendly laminated particle panels and comes with a bracket to fix it to the wall. Invisible Bookshelves are a great choice for people looking to save space and minimalism. Wood has a charm of its own that cannot be replicated by any other material. The richness and warmth of a narrow wood bookshelf make a room inviting and luxurious. You can opt for varying shelf space, depending on your need. As the name states, this bookshelf comes with four narrow shelves, but do not let it fool you. It is extremely versatile and functional. The unit is made from solid wood and composite wood, giving the shelf a warm, luxurious Espresso finish. The ladder-type frame and the rectangular shelves are extremely eye-catching. If you are worried whether it will have sufficient space to house your books and other small items, you needn’t worry. It is 13.5 inches wide, 11.2 inches deep and 55 inches high, making it the perfect shelf for any home or office. Take a look at our review of Leaning Ladder Bookshelves to see different choices that suit your corners. If you want more shelf space to display your collection of books and other decorative items, this five-shelf narrow wooden bookcase is ideal. 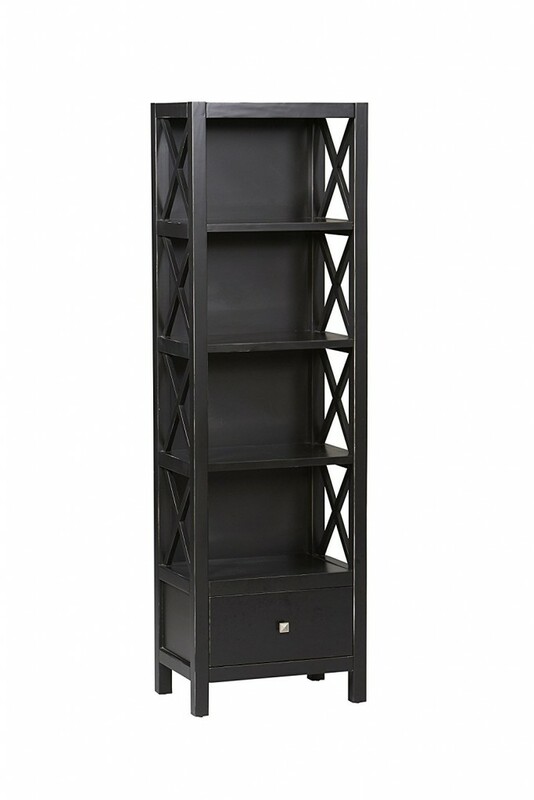 It can be installed in any room with confidence as the rich Espresso finish makes this bookcase stylish. The overall dimensions of the bookcase are 14.5 inches width x 11.81 inches depth x 56 inches height. The assembly of the bookcase is easy and quick, and after finishing, you can pair it up with baskets to increase storage space. Made from solid wood and composite wood, this bookcase is an epitome of functionality and grace. Here is our another review collection of Ladder Type Bookcases – which are well suited for small spaces and big rooms alike. As your book collection grows in size, your need for shelf space will also increase. So, why not opt for something that looks chic and contemporary without sacrificing on your storage needs? This six-shelf narrow bookcase is 12 inches wide, 11-3/4 inches deep and 72 inches high. So you can easily store large books and periodicals along with three-ring binders. It’s inviting mahogany finish is appealing to the eyes, and gives it a professional look and feel. The clean lines of this wood bookshelf along with its contemporary design make it the perfect storage solution for a workplace or home office. Its walnut finish blends seamlessly with any décor, and the sturdy construction ensures it can carry weight effortlessly. The bookshelf has a total load bearing capacity of 100 pounds when the weight is evenly distributed. The seven-shelf narrow wood bookshelf is made from compressed wood and has an elegant wood veneer finish. The unit comes with dimensions of 12 inches width, 12 inches depth and 84 inches height. Black-colored furniture is considered trendy and contemporary. Hence, you will find a large collection of black bookshelves. If you are looking for panache and style along with ample storage space for your books and other treasures, opt for one of the following narrow black bookshelves. The five-tier narrow black bookshelf comes with five open, easy-to-access and functional shelves. Out of the five shelves, two are fixed shelves while the remaining three are adjustable. Each shelf has the ability to support up to 30 pounds of weight, making it the perfect addition to a home or office that requires a storage solution that does not take up too much space. Made out of eco-friendly laminated particle panels, the unit is 19 inches wide, 11-1/2 inches deep and 71-1/4 inches high. When your book storage needs keep changing, this flexible and adjustable narrow bookshelf will come to your rescue. It comes with three adjustable shelves and five cubby holes. It is constructed using high-quality MDF and particle panels, making it quite resilient and durable. It has a rich matte black lacquer and black melamine finish. Weighing merely 47 pounds, the unit boasts dimensions of 13.8 inches width x 15.8 inches depth x 60 inches height. You have to agree that black is a timeless color and when you get this tall, narrow bookshelf, you will love the way it transforms the room. The antique black finish is further heightened with a red overlay. The unit comes with five shelves and a drawer, which is great for storing remotes, magazines and other small items. It boasts a solid construction since it is made from pinewood and painted MDF. This gives the unit a stunning look and feel. It measures about 72.2-inch high x 22-inch wide x 11-inch deep. Made from beech wood, this folding narrow black bookcase has a unique, contemporary design. It comes with four well-built bull-nose shelves that are rectangular in shape. It has open ladder-style sides, and support rails at the back for added reliability. If you need to move it or feel you do not need the storage space, you can fold it down to just 3-1/4 inches from 14-inch width, 11.4-inch depth, and 51.3-inch height. This versatile bookshelf can also double up as storage space for kitchen appliances. Read: – If you are interested in folding type bookshelves, read our review of Top 15 Folding Bookcases. It is not necessary to always go in for a tall bookshelf or bookcase. This is especially true if you want to add one to your kid’s room. The good news is you do not have to go in for a conventional bookshelf or bookcase when you can choose from these narrow, low bookshelves and bookcases. If you live in an apartment or small building where space really matters, these narrow bookshelves can help you though. This two-shelf low bookshelf is perfect for kids (and adults) of all ages. It can easily accommodate books, toys, and decoration items. Its flexible nature means you can add more shelves to enhance the storage space as your storage needs increase. The rich Espresso color along with its classic design ensures you never have to worry about style or functionality. The dimensions of the unit are 11.2 inches width x 13.5 inches depth x 29.2 inches height. If you are looking for a freestanding bookshelf that is trendy and practical, you just cannot go wrong with this three-shelf narrow, low bookshelf. Constructed out of PEFC-certified wood, the unit comes with adjustable shelves. The pure white color adds to the overall look and feel. You can easily customize the bookshelf with a glass door or solid wood door. The dimensions of the unit are 16-inch width x 10.5-inch depth x 42-inch height. When you are searching for something unique yet modish, this rattan-style bookshelf will satisfy your needs. It is made from durable, lightweight wood frame that is enveloped in natural plant fiber cord. The unit is dyed in natural colors to give the shelf a glorious mahogany color. This collapsible bookshelf is easy to store, and hardly takes a few seconds to assemble. It is a wonderful addition to any home or workplace because of its elegant looks. It is 33.5 inches tall, 19.8 inches wide and 10.2 inches deep, ensuring you have ample storage space for books and other small collectibles. If you are interested in some classic bookshelf choices, then take a look at our review of Bookcases with Glass Doors – which are classic bookcase models which can add to the elegance of your interiors. As an avid reader, you should never compromise on your bookshelf or bookcase choice. Besides functioning as the perfect storage option for books, these narrow bookshelves and bookcases also turn into decorative furniture that can transform a room for the better. Pick your bookshelf based on its appeal and functionality, and you will never go wrong.